As part of CFC Construction's ongoing commitment to safety, we recently partnered with OSHA to host a Stand-Down at all of our construction sites for Fall Safety awareness and training. CFC Construction's Founder & CEO EJ Olbright speaking with Area Director OSHA Englewood Area Office, Herb Gibson. 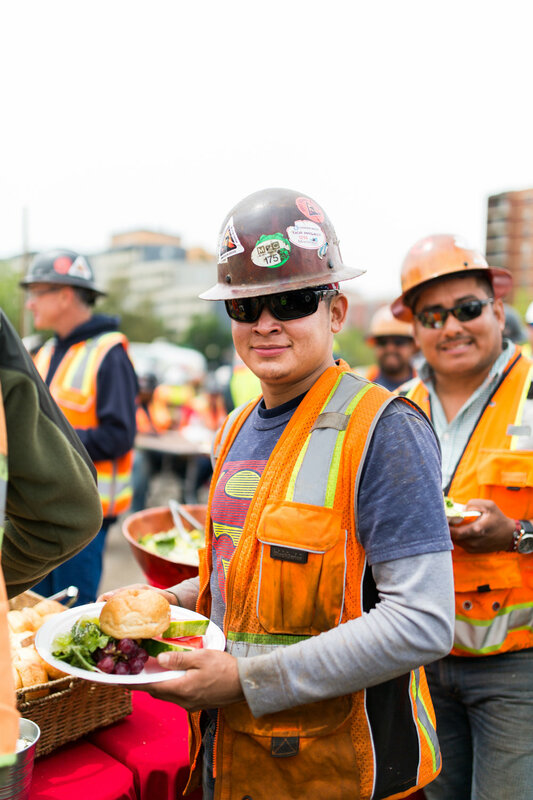 CFC hosted this special event simultanously at all of their active construction sites where we brought in safety trainers and lunch. The main event was held in downtown Denver at the corner of 14th Ave and Speer Boulevard at the future site of the TriVista. This annual event is held across the country during week in May to highlight the importance of Fall Safety awareness. In the photo on the right, from left to right, Megan Meagher, Assistant Regional Administrator Technical Support, Region VIII, Dave Nelson, OSHA's Herb Gibson, Area Director OSHA Englewood Area Office and CFC Construction's EJ Olbright. 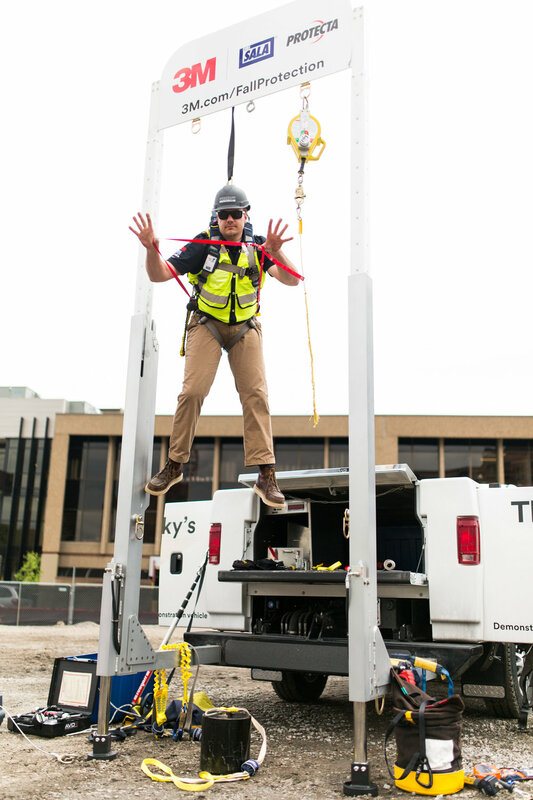 Safety trainers provided demonstrations of safety practices and proper use of fall safety equipment designed to the save lives of workers who regularly are at risk of falls in their every day activities on the job. CFC Construction made this an all company event from construction works, office employees and sub-contractors. They communicated the company's ongoing commitment to providing a safe environment for everyone. That responsibility extends beyond management to every single worker looking out for their own safety and the safety of others. Everyone was reminded of the statistics of 100% preventable fall deaths and injuries. The emphasis was on mindfulness and not taking your safety for granted. Most accidents happen when least expected. Even if they feel in control, factors outside of any worker could cause them to lose footing or be swept off a ledge. By using their safety equipment properly they will prevent a fatal fall or career ending injury. They also need to promote a culture of safety for the benefit of their colleagues -- especially in an environment with workers who are coming onto a construction site varying levels of experience. The event was a great success. We were happy to work in collaboration with OSHA who were equally as pleased with the turn out and the value of the hands-on demonstrations. A hearty lunch was served up. 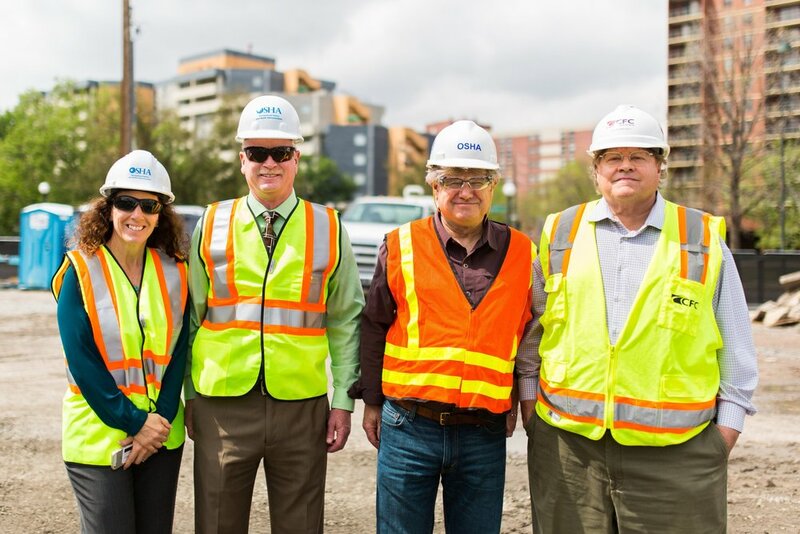 On the left, OSHA reps observe the safety training demonstrations, and on the right EJ Olbright stands alongside OSHA's rep and CFC's Construction's Don Gendall. Safety is at the heart of our culture. Read the article published in the Colorado Real Estate Journal on how we continue to evangelize "On-the-job site safety is everyone's responsibility".